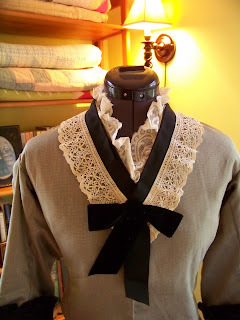 Several of you -- Laura and Marion and Caroline, I am looking at you:} -- have commented about the removable fichu-collar that I added to the 1870 bustle dress. You're right, Marion, costumers don't seem to use them much for bustle dresses, and I am not sure why, because they're so useful. 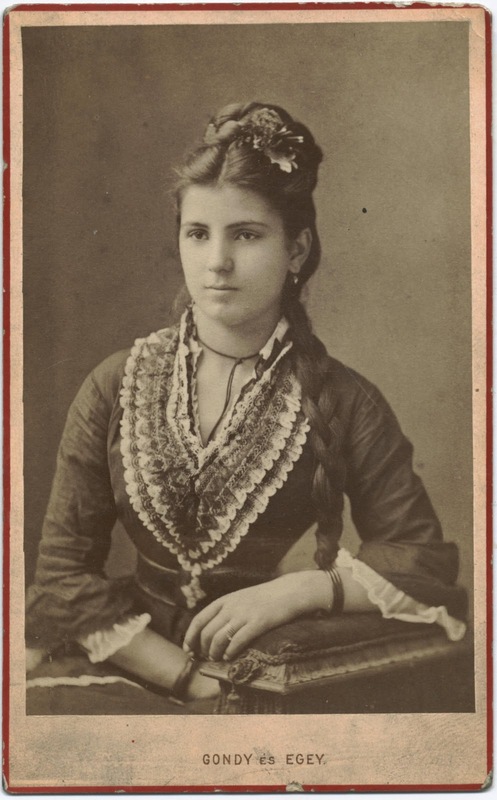 Removable collars were common throughout the 19th century, or at least from the Romantic era forward. At their base they were a functional item meant to protect a dress neckline from inevitable oils and perspiration. Yet if you had only a few dresses, by changing out your collars you could vary the look of your ensemble, and show off your needlework skills into the bargain. Pretty good deal, I say. curls dangling down from the hairdo, and probably entangling with the jewelry: ow! Here are a few examples. There are literally hundreds of them on Flickr and other photo sites, if you have a look around. Here's a squared collar. 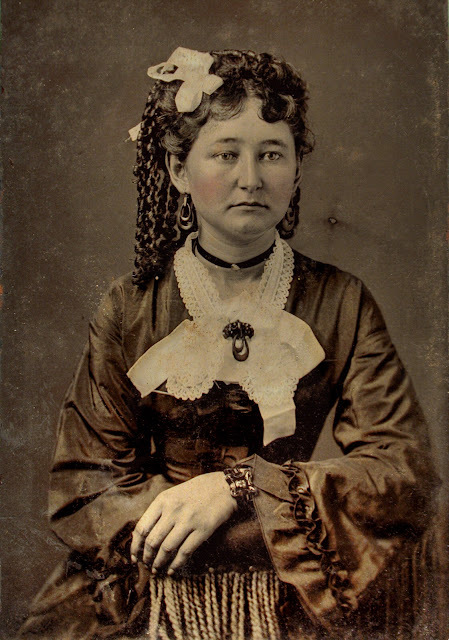 Photo taken in Kansas, early 1870s. From ilgunmkr. By the way, there were plenty of other collar-y sorts of decor one could adorn one's neckline with. Some women preferred dress trim for the large effect, confining lacey trim to lace tucked inside the neckline, lightly gathered. This could be the case when ruching was used heavily on the bodice, or a collar with revers. Lappets, if that's the right name for them, were also popular, and you see them on Etsy now and again, and also in the magazines. They're just long lengths of lace, with rounded ends, run round the neck and pinned shut with brooch or brooch and bow. and held, with an added bow, by what appears to be an articulated brooch. Then there was just wearing a little old collar, or the tried-and-true bow, or a jabot. Lots of options. fabric pinked with a curved pinker? Notice her drop earrings and snood. Now for embarassment: whence the name collarette? I have lost my citation! When I find it, will amend this post. Ah, documentation fails sometimes. 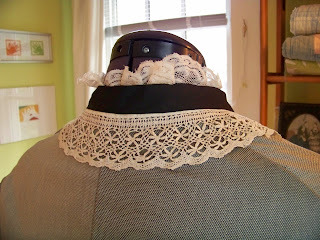 That's why I am calling this a fichu-collar throughout this post. The fichu-collar often formed a vee-neck, as in the examples above. Why do we not see more vee necks among costumers for bustle dresses? They were probably more common than the perennial costumer favorite, the square open neck, attractive though that is. An open, low neckline was, to my understanding, more an evening thing; during the day one would fill that in! 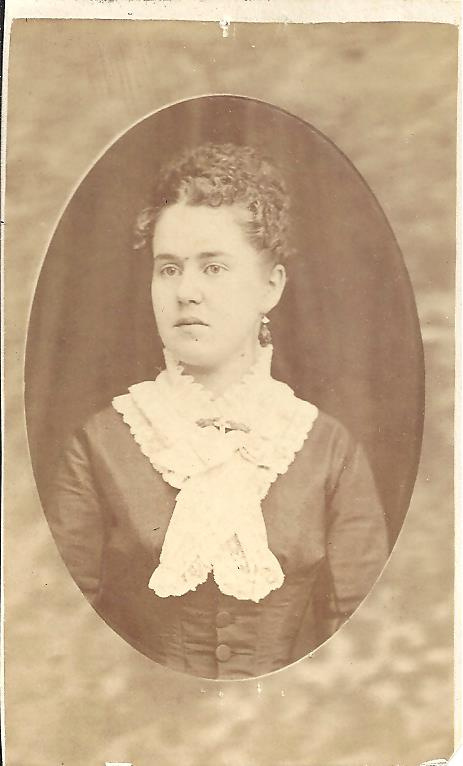 Ribbon bows were very commonly worn with these collars. They finish the effect, of course, and are another 18th century reference, but had been also favorite collar decorations for the past decades, so why give them up? 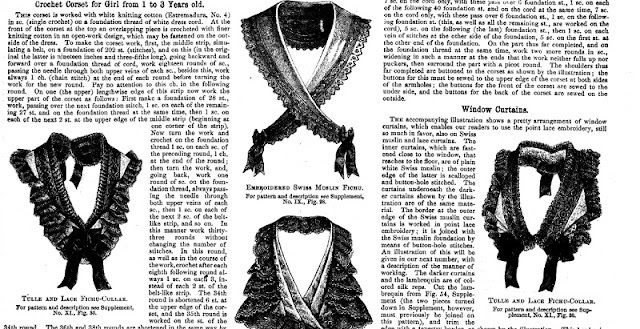 Sometimes these collars were just called fichus, and might have short tails (as in the Harper's page above), but not really be actual long fichus, although those had existed as well, in lace or net, to be swathed around the lucky wearer, particularly at the end of the 1860s. I refer you to Harper' s Bazar for those, and especially to Frances Grimble's Reconstruction Era Fashions, since she includes scaled patterns for them. By the 1870s, there was so much going on around the skirt, what with the bustle and all, that throwing a fichu into the back ornamentation was too much for even that ueber-decorated period. 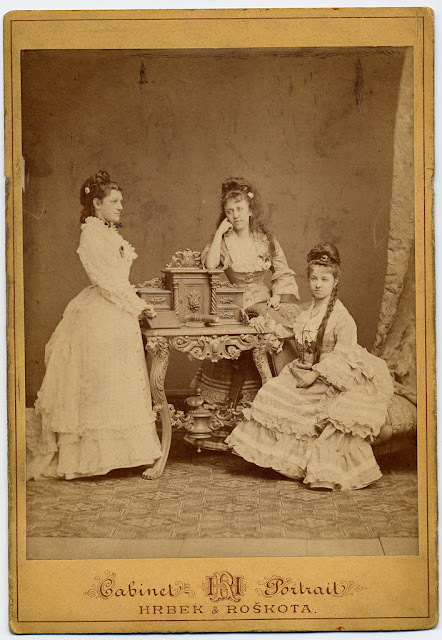 Here are three from Harper's, March 4, 1871. Here they're all called fichus, even the one on the right that actually mimics a squared dress neckline. Nomenclature, it's so specific when it comes to fashion, isn't it? The first uses puffed tulle and lace, the second lace insertion, Swiss muslin and lace, and the last white pleated tulle and lace. Let's dig into the version that made it onto my dress. 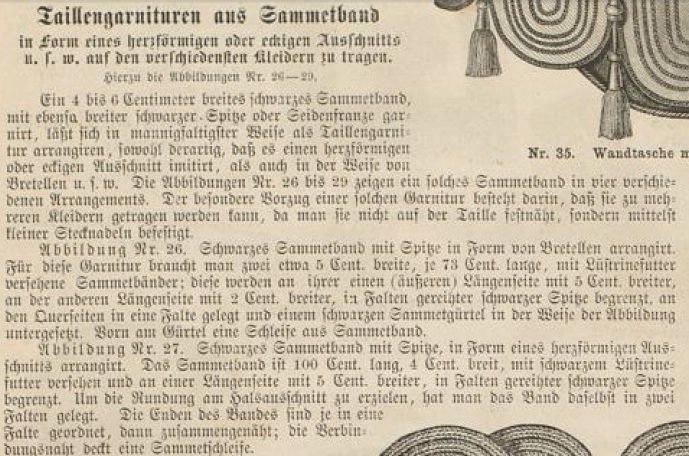 The basic design comes from Der Bazar, the German magazine from which Harper's obtained a good bit of its content, in the January 9, 1871 issue. 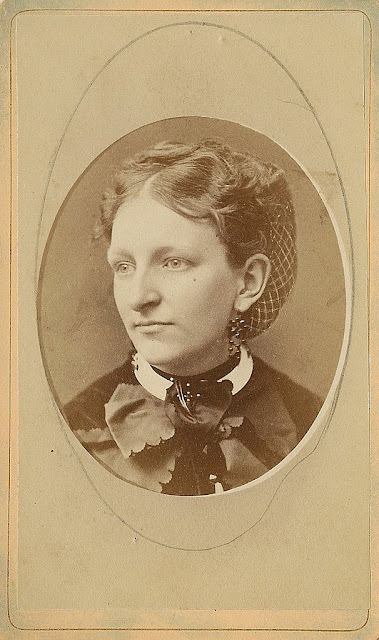 Yes, much of my research dates from 1871, or from 1868-1869. 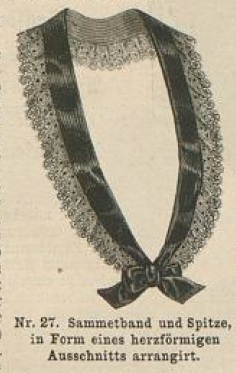 "Bodice Trims of Satin Ribbons cut in the form of a heart shaped or with corners, fitting differing clothing"
A four to six centimeter wide black velvet* ribbon, trimmed with a little wider black lace or "Seidenfranze", arranged in many folds as bodice trim, designed, so that it imitates a heart-shaped or cornered shape, and also like bretelles. The figures numbers 26 through 29 show of these trims in four different arrangements,so that they can be worn with several dresses, insomuch that one does not sew it to the bodice, but instead fastens it with small pins. Figure number 27. Black satin ribbon with lace is arranged in a heart-shaped cut. 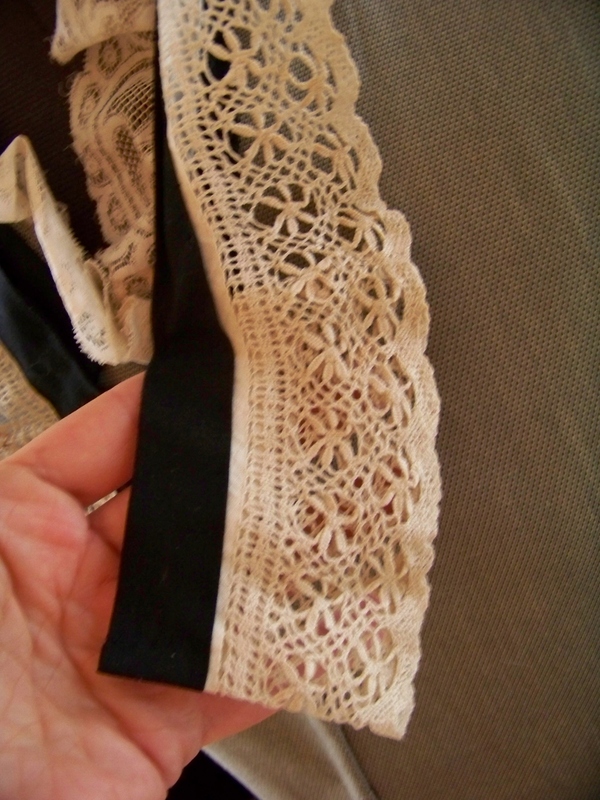 The velvet ribbon is 100 centimeters long, 4 centimeters wide, bordered with black "Lueftrinefutter" and on one of the long sides with 5 centimeters wider, bounded by pleated rows of black lace. In order to achieve the rounding around the neckline, the ribbon is laid into two pleats. The ends of the ribbons are put in a pleat, then sewn together; the joint covered by a velvet bow." *Sammet is an old term for velvet, not for satin, as I had translated originally. Thank you most kindly, Sabine of Kleidung um 1800, for the correction. Sabine further reports that because the old velvet was smooth and shiny, it could look like satin when drawn. Whoo. That translation took a while, since it's hard to see the text very clearly, and the language is a wee antiquated. I had to resort to Beolingus, a favorite online dictionary, a good bit. "Seidenfranze" remains impenetrable: it's something silk. "Lueftrinefutter" really got me: it's some sort of airy lining fabric, perhaps? Yeowp. What did I do? My dress is some sort of broadcloth trimmed with plain weave black cotton, you know, the inexpensive, nay, cheap, type sold around Halloween for $2 a yard. Given the matte effect of the cotton, and a non-existent budget, I used more of that black cotton instead of black satin ribbon. I took a two-three inch-ish wide strip of the cotton, cut on the straight, long enough to fit around my neckline plus some extra for ooomph. Remember that the collar is wide, so if it's longer than your neck opening that doesn't matter too much, because the lace hides the dress fabric. I folded it longways, then turned in each long edge again to hide the raw edges, and starched it stiff as stiff. Fold in the long raw edges, and press. Then I folded the strip in half, and starched it again. Now I had a nice strong base to work with, that reminds me in looks of bias tape, but cut on the straight. Fold the strip in half longways and press again. Then from my stash of antique lace, I found a long, beautiful piece that had been sewn to what seems like fine starched muslin, and cut from a dress...probably it had been a collar, too, since it had a natural curve. It wasn't long enough to pleat as in the Der Bazar example, but not all collars featured pleating, and as the lace curves, it waves a bit, as you would expect. It was a little longer than the collar base strip, so I folded the excess underneath at the ends. It doesn't show underneath the ribbon bow. I put the bodice on my mannequin, placed the black cotton strip around the existing collar line, and pinned it there. 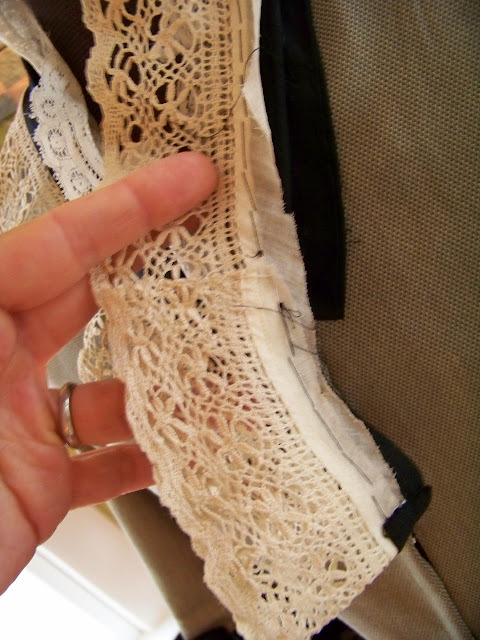 The doubled edge was to the inside, the clean fold next to the lace, where it might be seen. Then I tacked the the lace to the cotton strip base, using a combination stitch, with very tiny stitches on the outside, so small they can't easily be seen. As I went, I shaped both the cotton strip and the lace to follow the neckline. At each end the cotton strip is turned under and sewn in place. The lace sewn to the cotton strip base. You can see the long side of the stitches holding the slace down. The back. The lace is simply tacked on. Mmm, I'd hate the feeling of bits of lace hugging my neck, chafe, chafe, chafe. Bet this is a wide cuff. Well, who knows? The closures are missing. Do you notice how the lace is narrowed in the middle not by trimming it, but just by bringing it further towards the top of the lining? Clever, and it saves the lace in case it's needed again. The final step? I'd forgotten about pinning the collar to the bodice, but since the existing neckline trim is a band of plain cotton placed just outside the neckline, it was natural to just tack it into place, again, right on the mannequin to assure the best fit. Now I had a collar, but it didn't join it at the bottom. Instead of sewing the bottom ends permanently at this juncture, and thus be forced to cut my precious lace, I chose to overlap the two pieces, and pin them together with a velvet (alas, not cotton or silk velvet) bow: one pin holds both bow on and collar closed. Lace may have been less expensive in the nineteenth century than in previous centuries, but I treat mine as if it were gold. After all, who knows what life it may lead in the future? Oh, N.B. The lace inside the collar is just tacked in place, raw. I need to affix the lace to a little band so that I can sew the band instead of the lace. I was careful, but still, that's better practice. I might also make it a little shorter, although you do see some very fluffy inside-the-neckline treatments in some antique photos. There you are. 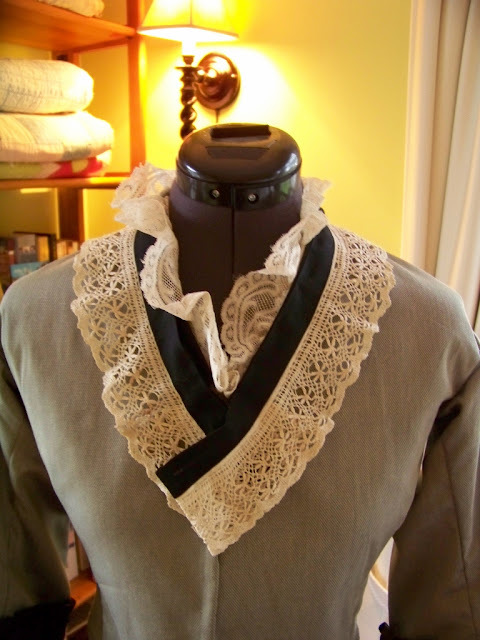 Here is the fichu-collar, before the bow is pinned to it to close it. Here it is with the bow added. You can't tell the ends are folded over one another, can you? Now you know what these whatsits are, where to find examples and directions, and how you can make them. There are directions galore in the magazines, and my little experiment to work from, too. So what are you waiting for? Go forth and collar yourself some neckline adornment! These are gorgeous! I think there is room in today's fashion for a variation on such things, too. How wonderful!! Thank you very much, I kept wondering how on Earth all those beauties in the magazines were made. You are an amazing costumer, the fichu looks simply perfect - like a magazine picture that came alive. I really love how it turned out! I don't think the internal band of lace is too wide - it looks well-proportioned to me. When it comes to the 1870s, I think there just hasn't been as much sustained research as for the Regency or Civil War or 18th century, so the idea of how necessary the collar still was just isn't as impressed on us. 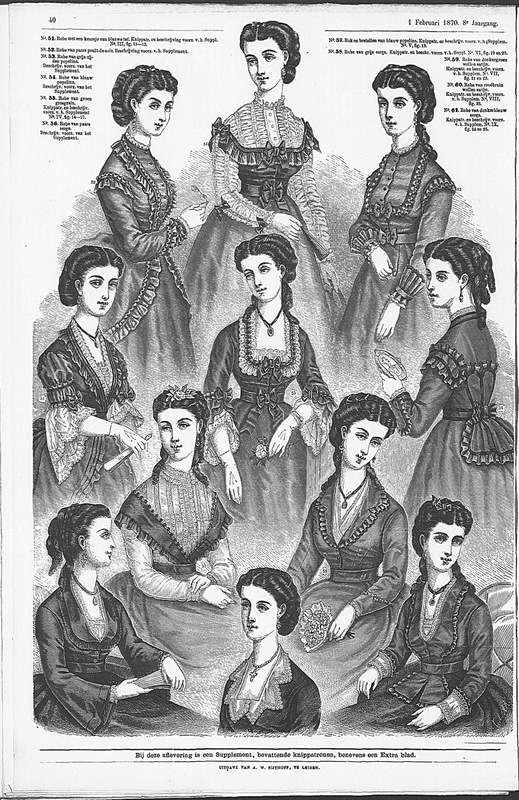 With regard to the necklines - that, I think, is partly the same lack of sustained research (the jewel neckline, seen all over the place in the 1860s, continued straight through the end of the century) plus what we find more flattering to ourselves, plus for eras that don't see a lot of events we want our garments to be as flexible as possible, and we'd probably rather wear a low-necked gown in the day than wear a day dress to an evening event. 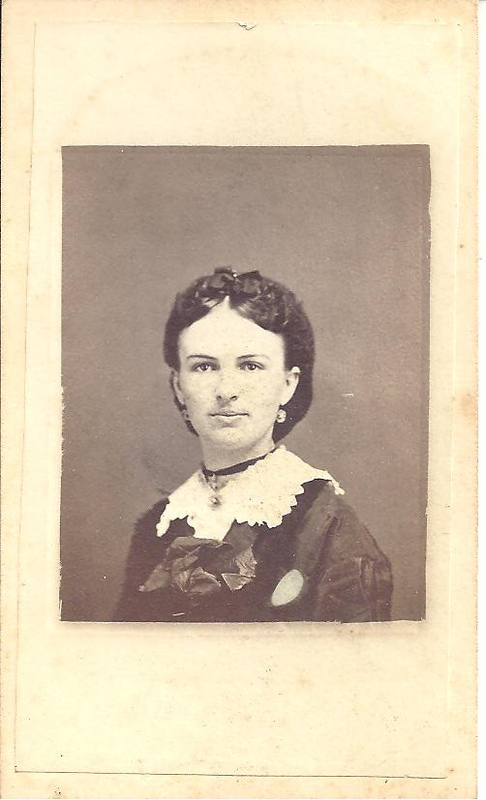 Mrs. C., funny you should say these collars would work now: was thinking the very same thing! Sleeveless white blouse with such a collar would be fantastic for lunch or dinner out. Just enough elaboration to make the blouse feel special. Very best indeed to all on KENTUCKY DERBY DAY! Some friends are there right now, but our family will watch from home this year and of course, I will wear a HAT. If I may, I drooled when I saw it. It is a stunner, and you looked amazing in the ensemble. What a happy thing to see your note this rainy morning: warms my heart, too. So you are from the Czech Republic? My parents love visiting there (I have a sister in Wien), and my husband fell in love with Karlovy Vary, that superb spa town that I *think* has the magnificent 18th century theater all hand-painted with murals inside, when he visited years ago. Wow, you like that 1795 dress? Thank you! I fit those sleeves right on the mannequin. From now on, that's the method. A pleasant Sunday to you, and by the way, I am now following your blog: it'll be neat to read! Great article and tutorial, I think it looks so pretty, just the thing to dress up a gown. I've pinned it to my Tutorials board in pinterest so I can find it when I need it! Golly, thanks! Sure hope you make one, because you have some wowser gowns to wear it with. Just one thing that I'd like to add 'Sammet' is the old term for 'Samt', which is velvet, not satin. Usually the old velvet is very smooth and shiny and in the drawings of the adds it might look like shiny satin. Eek, Sammet is velvet! Makes good sense, because velvet was a favored material in the 1870s. I will edit that and credit you with the correction immediately. Hugs,and I promise you, one certain piece of late 18th century spenceration is close to finished, a year later, begad. Aww, so you've got a sister in Wien? How lovely, I've got an aunt there and I absolutely adore that city, be it the palaces, Stephansdom, the trams (so adorable!) or the confectionery shop where the Empress Elisabeth used to get her sweets! I'm very happy your parents and your husband like my country:-) Yes, there is a very beautiful theatre in Karlovy Vary with a lovely painted curtain (by Klimt brothers I think)! As for that 1795 dress, yes, I adore it! It's elegant and classy, plus the goldwork makes it look fit for an Empress. To be honest I thought of Empress Josephine when I first saw it. Thanks very much for subscribing to my blog, you are way too kind - I'm pretty much only starting out with blogging, so I hope you won't be too disappointed. Also please allow me to apologise for the delay in replying - I'm quite sickly and sometimes I get too tired to do pretty much anything. Except for ogling beautiful clothes - so I'm very much looking forward to seeing your next projects! They make me smile. Good evening, and nice to hear from you! Very happy to subscribe to your blog. It's always a thrill when I find a new author who is sharing their perspective on the world, their joys, sorrows, experiences, interests. No worries on any delays; I read that you've been ill, and empathize. I've a chronic condition and sometimes it knocks me offline for awhile; c'est la vie. Still, being ill gives one a different view of life: it's more precious, even through the suffering. Very best to you then, as you make your way back to health. Uh-oh, bedtime, dear husband says; it's not late per se, but we retire early in this house. Older parents + small children equals everyone in bed early!